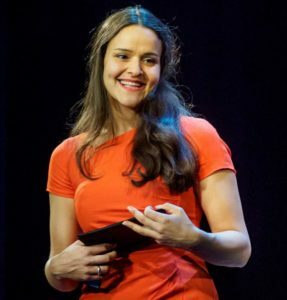 Yamina Enedahl is person who loves to develop; whether setting a world record in freediving; coaching individuals, and organizations, authoring books, penning speeches, and songs; or describing and develop our inner capacity for sustainable achievement through digitalisation. Though she could swim by the age of two, it was only when Yamina began swimming competitively, at age 5, that she learned to swim with her head above the surface – a prelude of things to come. Prematurely ending her swimming career at the age of 14, after becoming dissatisfied with the authoritative nature of traditional coaching, and not wanting the measure of her self-worth to be derived solely from her competitive results. She began to teach and coach swimmers, eventually working as a subject teacher for elementary students, while in her 20’s. During her studies at the Scandinavian International University, Yamina continued to develop her mental techniques; there, she became a Certified Mental Trainer Master. Yamina’s return to the world of aquatic competition came after befriending a colossal manta ray, while on a trip to Indonesia. This is where Yamina discovered freediving. By integrating mental training techniques into practical application within her freediving training, was Yamina able to overcome her fears and traditional mindset. Soon, she discovered and developed a philosophy of achievement, that has lead Yamina to become Sweden’s first world record holder in freediving. Yamina has continued to further refine her perspectives, and to extend these exciting principals to organizational structure, applying them to the Lean philosophy of management. Yamina Enedahl has over years professional experience, coaching individuals, groups and leaders; at various levels, and in diverse circumstances. On an operational level, she has created cooperative strategies for school, police, and social services. Using the Lean Philosophy, Yamina has developed five different labor-market programs, and opened two new offices, from their inception. Motivating underachieving students to top grades, Sweden’s best football team to victory in the Swedish cup, immigrant women in their fifties to their first job in life, flustered executives and leaders to more balance. Today Yamina is a working as a consultant, moderator and speaker. She is an entrepeneur in digitalisation/positive psychology.